I have been celebrating the birth of Bitcoin by going through Satoshi’s writings. As we all know, the Bitcoin whitepaper was published on October 31, 2008 – the Halloween… Although we do not know whether this was intentional, we do know that Halloween is the time for trickery, but it is also associated with rebirth or the birth of something new. In old Britain, the New Year was celebrated on November 1. Celebrations like Halloween fall in line with the old European Carnival Culture – where you wear a costume and a mask to cover your true identity, to appear like someone else. And as Hal Finney said: “I have always loved crypto, the mystery and the paradox of it”. Thus, it’s not unreasonable to assume that the publication date was chosen intentionally. In a few of his posts and correspondences, Satoshi discusses some of the possible use cases for the Bitcoin network. Most of these comments were made back in 2009. It can already be used for pay-to-send e-mail. There are a few more cases spread throughout his writings. To the dismay of the “bitcoin maximalists”, Satoshi Nakamoto shows the path for many ICOs that will be exploring these use cases years later. Although it is obvious that Satoshi is referring to the Bitcoin Network, not to the plethora of new blockchain networks and DApps; nevertheless, it’s hard to argue with the fact that the Bitcoin2018 is not well suited for most of these cases for various reasons; without getting deep into this topic, I’ll mention just a few obvious ones: speed/network congestion, cost (Satoshi himself notices on August 4, 2010: “Bitcoin isn’t currently practical for very small micropayments. Not for things like pay per search or per page view”, and security (most of the bitcoin holders would not want to expose their bitcoin wallets for trivial transactions). However, the last case really caught my eye – the email case. I was way too familiar with this case although I had never read Satoshi’s post before. Immediately, 21.co came to mind: a Silicon Valley startup which urges us to “Earn bitcoin by replying to emails”. In the meantime, it has changed its name and now it’s called Earn.com. It raised $5.1 million in Series A back in 2013 (under the name of 21E6, a bitcoin mining company) and Winklevoss Capital was amongst the investors. However, according to Balaji S. Srinivasan, by 2015 the company, finding itself in the aftermath of the 2014 Bitcoin crush, had a huge hole in its budget. This didn’t prevent a $116 million round B (the investor list represented the who of who of the traditional funds and crypto funds: Andreessen Horowitz, Pantera Capital, Khosla Ventures). As of today, Earn.com is a fast-growing, cash-flow positive business with a multimillion dollar revenue run rate. Hundreds of thousands of users have signed up to earn free cryptocurrency by answering emails and completing tasks. And thousands of senders have used Earn.com to send out paid emails and surveys to large audiences. I think it’s fair to say that it’s one of the first truly useful blockchain-based applications. In April of 2018, it was acquired by Coinbase. The deal details have not been disclosed, but it’s been reported that Coinbase had to pay in excess of $120 million (the amount that had been invested in prior rounds). According to the same source, the company is planning to replace bitcoin with its own ERC20 token. I tweeted to Ben Horowitz – no reply. Subsequently, I had a post on LinkedIn on the same topic tagging all the key people. – Still, silence. The only response I received was from Adam Back, who liked my tweet. 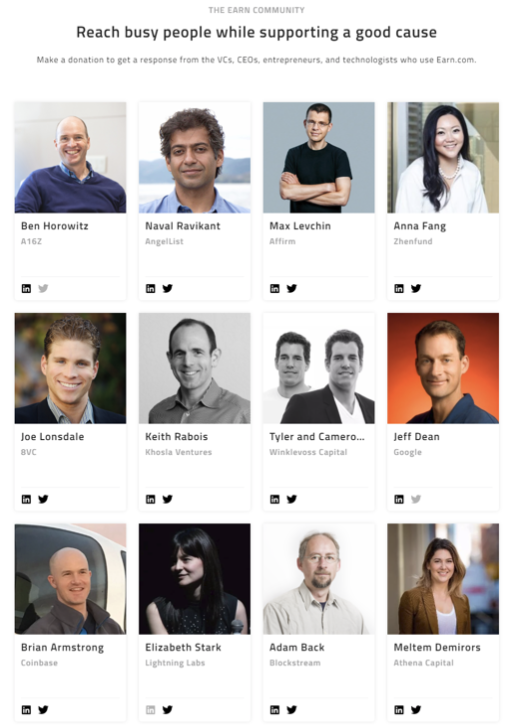 Adam Back is featured prominently in the Earn.com community (he is in the third row). There is nothing wrong with borrowing, on the other hand, the idea appropriation is less attractive. 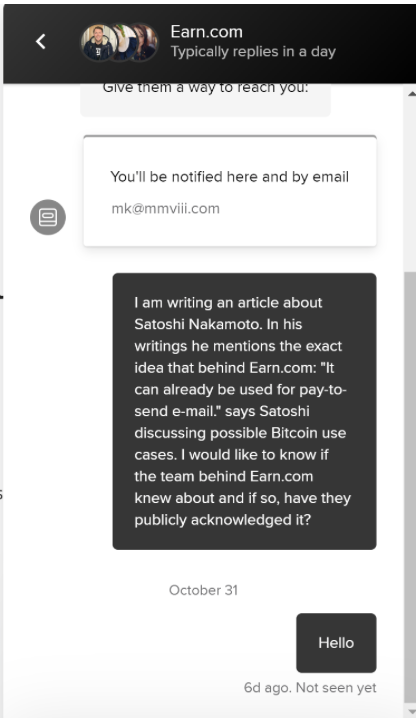 Can this silence be explained by the concern that Satoshi Nakamoto will take Earn.com to court to fight for royalties? This would seem highly unlikely for the man or men who decided to disappear and who leaves his approximately one million bitcoins untouched. Additionally, generally speaking, ideas are not patentable. A more probable explanation would be given by ignorance. Perhaps that no one in the Earn.com team was aware of this fact. If this is the case, then it’s not too late to correct it. 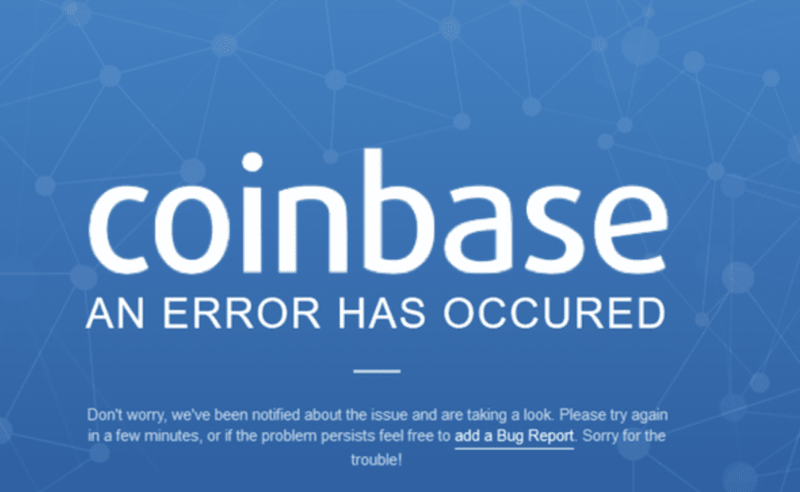 And now that the company is owned by the Coinbase, this would seem even more appropriate. This could be a powerful PR move. Otherwise, all the parties involved are in danger of facing the wrath of the Crypto Gods.